Pedro Terán knew what he was getting into. 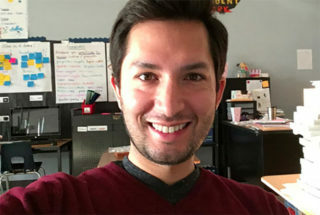 Terán, 33, was living in Saltillo, Mexico, two years ago when his sister posted an ad on Facebook that said the Dallas Independent School District was looking for teachers. The district had sent recruiters to Monterrey, about an hour from Terán’s home, to find educators to help meet the demands of its mandatory bilingual programs. If Terán aced his interview, met requirements, and passed a state certification test, he could teach for up to six years on an H-1B visa — a program that offers employers the chance to find workers with unique skills they often can’t find in American candidates. And if he performed well, the school district might even sponsor his application to remain in the U.S. permanently. But from the beginning, Terán said, recruiters made no secret of the possibility that everything could shift if President Donald Trump decided to change the visa program — which he’s since indicated he may do. “We’ve always known it’s a possibility, but if the program were to end I’d be very sad, both for myself and my colleagues,” he said. Despite indications of a crackdown on the H-1B program, the Trump administration has yet to enact policy changes in this area. But enforcement of existing laws has tightened for the thousands of migrant teachers in this country, sending waves of anxiety through circles of educators already in tenuous positions, experts and district officials say. While the visa program has not received the attention of the Deferred Action for Childhood Arrivals program or the travel ban, experts say it appears to be part of the administration’s stricter approach to immigration policy. San Diego-based attorney Vaani Chawla, who works on employment-related immigration issues, said she’s recently seen more intense scrutiny of visa applications and longer lag times as they’re reviewed. That was underscored in late June when 25 educators had to leave the country after applications to renew their visas were held up for a federal audit. The review will take an additional six to eight months — long enough for the educators’ visas to expire, forcing them out of a country some of them have called home for more than a decade. A spokesperson for the Los Angeles Unified School District said the district has started acting earlier to renew teachers’ visas in light of concerns raised elsewhere. Los Angeles has 25 teachers with H-1B visas, with three set to expire. The teachers help staff the district’s growing dual-language programs, which now include Mandarin and Korean. Denver Public Schools currently sponsors 130 teachers under the visa program, which a spokesperson said has helped fill the district’s need for Spanish-speaking teachers. And this year, 250 teachers are working in Dallas ISD on H-1B visas. Future restrictions to the program would impact not only the teachers working on guest visas but also the school districts that have recruited them to fill hard-to-staff positions. Jordan Carlton, Dallas ISD’s manager of talent acquisition, said the state’s mandate to offer bilingual education for English learners in elementary school means the district has trouble finding the roughly 400 bilingual teachers it needs to hire each year. “We do our best to recruit through the region, but Texas just isn’t producing enough teachers through traditional programs to serve our students,” Carlton said. Dallas’s position points to the uncomfortable new reality for migrant teachers. Like many immigrants, they came to this country for economic reasons, and they fill a niche the economy has trouble filling elsewhere. Having been here for sometimes more than a decade, many have settled in their communities and bonded with students, never expecting a major change in U.S. policy. In recent years, as the U.S. economy has improved, the practice of hiring foreign educators has been on the upswing. Lora Bartlett is a professor of education at the University of California, Santa Cruz, and the author of Migrant Teachers, which examines America’s growing reliance on teachers trained overseas. Bartlett found that between 2000 and 2009, almost 100,000 teachers were recruited from overseas to work in American classrooms. For a sense of scale, that number dwarfs the 56,000 teachers recruited by Teach for America in its 27-year history. The practice took off after 2001, with the implementation of No Child Left Behind, a federal law that required school districts to employ highly qualified teachers or face funding cuts. At the time, school districts, particularly those in urban communities where turnover is routine and positions are hard to fill, were desperate to tap into the pipeline of new talent, Bartlett said. An early wave of teacher-recruits left the Philippines and landed in Compton. When one recruit arrived in Los Angeles just before Christmas 2001, an immigration official at the airport glanced at his visa, saw his destination, and asked the incoming teacher if he’d brought a bulletproof vest, the Los Angeles Times reported at the time. Today, foreign teachers come from countries around the globe, with many from India, Jamaica, and China. But the Philippines, with its English-speaking school system modeled after America’s, made for an ideal source. “Over 100 years ago we planted the seeds of the teaching system that we’re now harvesting,” Bartlett said. In May, the New York Times reported on one school district in Arizona that’s recruited more than 50 teachers from the Philippines since 2015. The Times linked the foreign recruitment to concerns around teacher pay: As educators across the country protest low salaries and poor working conditions, those from countries with low costs of living may see American teaching salaries as a boon. However, the Arizona recruits are employed on J-1 visas. Unlike the H-1B, the J-1 visa is meant to be a temporary program that fosters cultural exchange; it offers no path to permanent residency. That’s partly why Bartlett believes leaning on foreign teachers may pose problems for recruits, students, and the teaching profession as a whole. “High teacher turnover leads to lower levels of student achievement. If we continue viewing these teachers as short-term stopgaps and allow them to turn over at high rates, we are going to undermine the opportunity for low-income students with the highest needs,” Bartlett said. A promise of a higher salary was one reason Terán came to Dallas. He had experience teaching both in Mexico and abroad. But even at his job teaching at a private school in Mexico City — which, at around $1,000 a month, paid better than most teaching gigs — he had to find extra work as a private tutor just to scrape by. Terán now makes three times what he used to. When he moved to Texas, he bought a car at a dealership and was able to pay it off in six months. “That was something that I would have never been able to do in Mexico,” he said. Today, Terán teaches second grade, in a classroom where 100 percent of students are Latino and most speak his native language. “Texas feels a bit like Mexico,” he said. Carlton, Dallas ISD’s manager of talent acquisition, said the district typically recruits international teachers who already have teaching experience. Before a teacher can score an H-1B visa and be hired, the district has to show that the teacher meets all qualifications for the job — which include passing state certification requirements — and that the district has tried, but cannot find, an American teacher to fill the role. After the six years of visa eligibility are exhausted, the district has the option of sponsoring teachers for permanent residency if they’ve proven their value and scored proficient on teacher evaluations. Those consist of classroom observations, student test score growth, and, in some cases, students’ evaluations of teachers. Teachers around the country have long pushed back against the notion of high-stakes evaluations, a practice that can mean rewards or punishment based on performance or growth in student test scores. But for Terán and others like him, the stakes are even higher — the evaluations could literally determine their ability to remain legally in the United States. Still, for the moment, Terán feels lucky to have a job and an apartment. He’d like to stay in Dallas, he said, if the district wants to keep him — and the policies governing his visa don’t shift beneath him.